2480-DST is rated 4.4 out of 5 by 26. Rated 5 out of 5 by JOE M from Great Product We have installed onto granite countertop with no issues after years. Looks great and cleans well. I called Delta to buy a replacement aerator and Delta is sending for zero cost. Great Service! Rated 3 out of 5 by 10bac1o from Pretty, but I love the way this faucet looks in my kitchen and it is of fine integrity. The sprayer, however, is very cheap and wobbly. It is not as nice as the faucet and the handles. Also, the left handles on my assembly comes loose with use and has to be tightened regularly. It is annoying to spend a good sum for rather cheaply made products. Come on Delta. Rated 5 out of 5 by desert dweller from yes totally worth the money I love this faucet. Exceptionally beautiful, even prettier than the picture. The faucet is well made and moves smoothly. The finish holds up well against our hard water and that is impressive. This faucet is totally worth the money. 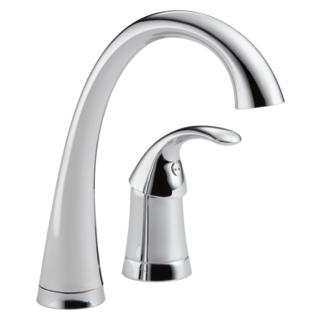 Rated 4 out of 5 by RLG from Delta Pilar faucet This faucet was specifically chosen because it had a separate hot and cold water handle. It was installed in a kosher kitchen where the client specified two handles to make it easier for the Sabbath when hot water is not used. The faucet fulfilled this requirement while still fitting into the design scheme as a contemporary styled faucet. My client was extremely pleased with our choice. Rated 2 out of 5 by Naomi from Splashes too much I have this faucet since January. Initially I liked the tall faucet and that it moved a lot from side to side. But this faucet splashes too much. Whenever I put anything under the flow, whether a high flow or low, the counter around the sink gets all wet. I'm pretty annoyed by it already. Rated 4 out of 5 by Jpopdaddy from A couple of things The spout seems loose like it needs a gasket in the space between the base and the spout. The spout can wobble, even though the base is tight to the sink. The other thing is the water pressure is not as strong as with the previous faucet. Is there a flow restrictor in the spout? Rated 4 out of 5 by Buba from Great look I have used my new faucet for two weeks now. Love how it all works with ease. It is so easy to keep clean. Rated 1 out of 5 by Noel from Terrible faucet Terrible faucet. Hose connections can be a serious problem and cause the faucet not to stay in position when moved from one sink to another. I have a corner sink and when moving the faucet to the other side of the sink, the faucet just moves back to nearly its original position. Delta's solution was to unplug all hose connections and then plug them in again. This may have helped a little. Paid about $400 or so for it, so must keep it and put up with the problem. Just have to be patient when moving the faucet, sometimes when using a lot of hot water, the problem of moving is not as bad. Does the faucet swivel at the base, or is it stationary? Can the spout go in at the first position, the handles in #2 and #3? None of the locations in my area have this product. How do I order it from you direct? Thank you for your question. Delta Faucet model # 2480-DST may not be stocked in your local retailer or wholesaler but they should be able to place a special order for you. Can you moun the spray assembly in the far left hole in the sink? Thank you for your question. 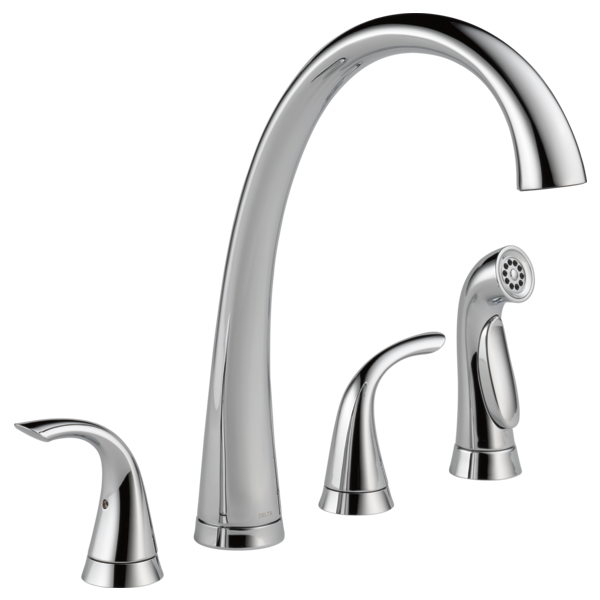 The spray assembly on the Delta Faucet model #2480-DST can be installed on either the right or left side of the sink!